Back in March, I mentioned that I was again working with Maria Baez Kijac, author of the award-winning and impressively comprehensive cookbook, The South American Table. This time, the topic was “ancient grains”–those super grains of Latin America that are so newsworthy these days. It was great to be working with Maria again–and the best part of working with Maria, since she tests all the recipes multiple times, is getting to try all the foods. So I can say with certainty that these recipes work and are mighty good. Of course, they also have the benefits of being gluten free and packed with nutrients from the super grains. Maria also includes tips everywhere as to how to alter recipes to personalize them. But eventually the fun, and the taste testing, came to an end, the book went to press–and now it’s out. 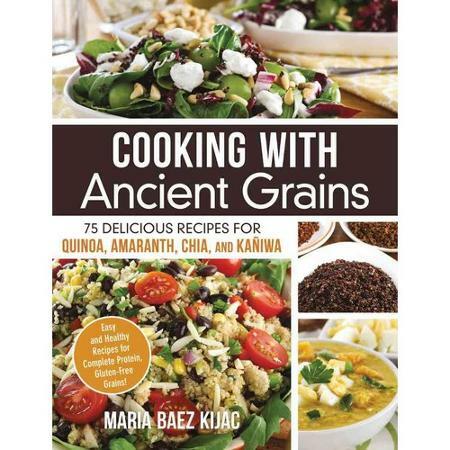 Cooking with Ancient Grains is now available for those interested in how to utilize these “nutrition powerhouses,” as Maria calls them. One thing I did note of interest (though possibly only to me) is that one my favorite recipes, the mushroom and watercress soup, doesn’t look in the photo like it does in Maria’s kitchen. If you get the book and decide to try this recipe, follow Maria’s instructions, not the photo–because in the photo, the mushrooms are sliced (which probably helps confirm for viewers that it’s mushroom soup), but in Maria’s soup, they are chopped. It always seemed to me as though the mushroom taste was magnified by the greater surface area presented by the chopped mushrooms. That said, it’s probably great no matter what you do with the mushrooms. I also loved the salads, especially the quinoa, black rice, and smoked salmon salad, and all the salad dressings. And the raw tomatillo and avocado dip. In fact, though one always has favorites, I can’t say that I ever tried anything I didn’t like. Because Maria includes detailed info about how to work with the grains, preparing them and how to use them in your own recipes, this is a useful resource if you’re new to quinoa, kañiwa, amaranth, and chia. And because the recipes are collected from Maria’s extensive travel, they’ll probably be of interest even if you’re already familiar with these grains.